Wiggly crochet is just a whole lot of fun, with tons of practicality. It is worked in a 2-step process and your finished project is 3-dimensional. How cool is that! The first step is making a foundation mesh. You can learn how to do this at Crochet Mesh. This mesh will be what shows on the back of your work and it will always be flat. This helps your projects, like rugs and coasters, etc., to have a flat surface to sit on or have on the inside of a pillow. Step 2 is the wiggly part. It is worked on the front of your foundation mesh. Double crochets are usually used for the wiggly stitches but any stitch can be used. These stitches are worked around the double crochet and chain-2 spaces of the foundation mesh. They create wavy, little lines on the top (front) of your work, which explains the name. These stitches are perpendicular to the foundation. So, they stick straight out from the mesh creating the 3-D look I talked about above. So, one side will be flat, the mesh, and the other side is cushiony, the wiggly stitches. This technique can be worked with any kind of yarn or thread, depending on what you want to work with or how you want your project to look. Keep in mind that acrylic yarn will melt. So cotton yarn or thread should always be used for potholders or hot pads. 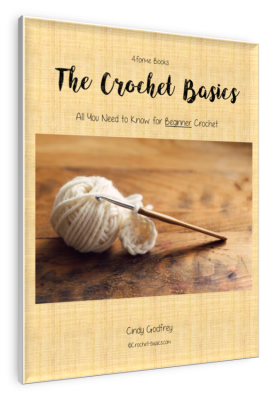 Patterns for this crochet are done with written instructions and charts. The foundation mesh is usually written and the wiggles are charted. This makes it easy to see the pattern of the design you’re working and the best direction to work it in one complete round. Many different designs can be created using that method. Basically, if you can make a chart for it, then it will work for this method. I think you’ll come to love this crochet technique as much as I have! Susan Lowman has created many wonderful patterns for this technique. 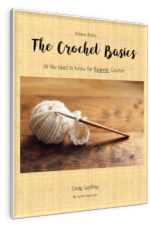 You can find more information and her books here at The Crochet Architect. 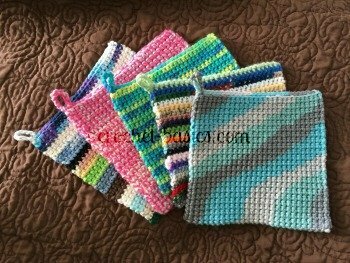 Susan also has a great free pattern for a hot pad and coaster at Red Heart. Please, come back and show me your projects!